RIT, Foodlink and Wegmans Food Markets collaborate on a community nutrition program that doubles up on fresh vegetables. 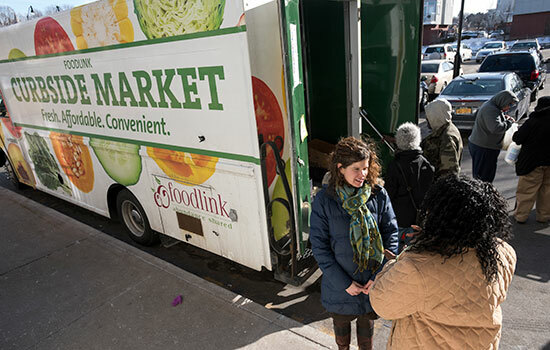 Here, Elizabeth Ruder, assistant professor in RIT's Wegmans School of Health and Nutrition, talks with a customer at Foodlink's Curbside Market. A federally funded pilot program developed by Rochester Institute of Technology professors promotes a healthy diet with financial incentives that allow Rochester, N.Y., shoppers to stretch their nutrition assistance benefits when they buy fresh vegetables at designated locations. When eligible participants in the “Cleaned.Cut.SNAP” program purchase fresh vegetables, they will receive additional vegetables of equal value at no cost. Elizabeth Ruder, assistant professor, and Barbara Lohse, professor at the Wegmans School of Health and Nutrition in RIT’s College of Health Sciences and Technology, developed the program with community partners at Foodlink and Wegmans Food Markets. “We know that consumers of all social economic levels want fresh vegetables that are convenient, but often, for shoppers participating in SNAP, the cost is prohibitive,” Ruder said. The 16-week program is funded by $100,000 from the U.S. Department of Agriculture Food Insecurity Nutrition Incentive program and $100,000 in matching contributions from RIT and Foodlink. RIT is one of 11 one-year FINI pilot projects and the only university nationwide to receive funding. 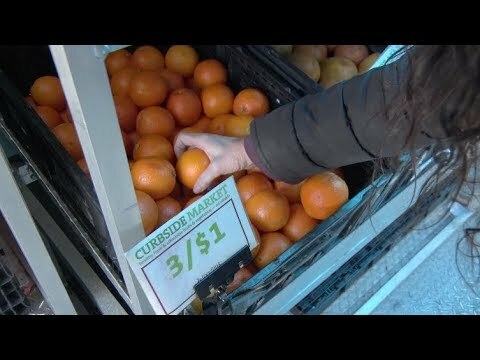 RIT recruited individuals currently enrolled in SNAP (Supplemental Nutrition Assistance Program) to receive weekly discounts of up to $10 to purchase fresh vegetables, including the Cleaned and Cut line of minimally processed vegetables at designated Foodlink Curbside Markets and Wegmans Food Markets locations. Cleaned.Cut.SNAP enrollment has concluded for the Curbside Market locations. SNAP shoppers at Wegmans can still enroll at www.tinyurl.com/WegSNAP. Contact Elizabeth Ruder at 585-475-2402 or elizabeth.ruder@rit.edu with any questions.